852552 Magnet Set Royal Guard 2009 is a magnet set containing Boba Fett, Princess Leia and a Imperial Royal Guard. All the minifigures in this set were from the year 2006. This is a description taken from LEGO.com. Please do not modify it. All the action of Star Wars™ Episode VI – on your fridge! Blasting out of Episode VI Return of the Jedi, these authentic LEGO minifigures of bounty hunter Boba Fett, Rebel hero Princess Leia and an Imperial Royal Guard include accessories and magnets to let them attach to your fridge and other metal surfaces. Facts about "852552 Magnet Set Royal Guard 2009"
All the action of Star Wars™ Episode VI – on your fridge! 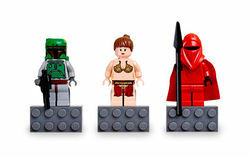 Blasting out of Episode VI Return of the Jedi, these authentic LEGO minifigures of bounty hunter Boba Fett, Rebel hero Princess Leia and an Imperial Royal Guard include accessories and magnets to let them attach to your fridge and other metal surfaces. This page was last edited on 30 August 2016, at 01:30.